In this section, you will find information on our colorants and opacifiers. 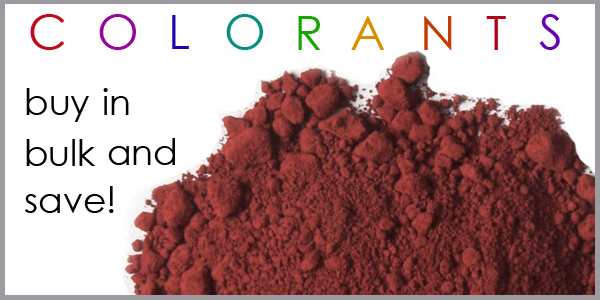 Colorants are chemicals, such as oxides and carbonates, which are often used in ceramics to produce colors in glazes, slips, and claybodies. Oxides and carbonates differ from stains in that the colorants are in their “raw” state, while stains -- such as those produced by Mason -- are commercially produced and consist of additional components. Oxides and carbonates tend to result in more natural tones -- think rusty oranges, warm browns, buttery yellows, pale greens -- although certain oxides, such as copper and cobalt, can produce strong, bright blues and greens. Stains often produce consistent and reproducible results, and they can come in some pretty wild colors, such as vivid purples, bright yellows, and blazing oranges -- basically, tones that can be difficult to achieve in a glaze by using oxides or carbonates alone. Here at The Ceramic Shop, we work with all of these 'color carriers' on a regular basis as we constantly test new materials and recipes for introduction in our own lines of glazes. Opacifiers are chemicals that are used to make a solution more opaque. If you have a recipe for a transparent gloss glaze, for example, you can add an opacifier and make that glaze opaque. Opacifiers are very often used in conjunction with colorants to produce an opaque glaze in a specific color -- for example, you might combine Zircopax and Red Iron Oxide to get an opaque orange glaze. In ceramics, common opacifiers, such as tin oxide and Zircopax (zirconium silicate), are often added to glazes to enhance their opacity/decrease their transparency. Adding an opacifier to an old glaze recipe can really change the look of the end product! Here at The Ceramic Shop, we have a wide variety of colorants and opacifiers in stock. Click on the products below to learn more about each chemical and its uses. If you have any technical questions, please don't hesitate to get in touch! Our knowledgeable ceramics technicians are happy to help you with any questions you may have about colorants and opacifiers.